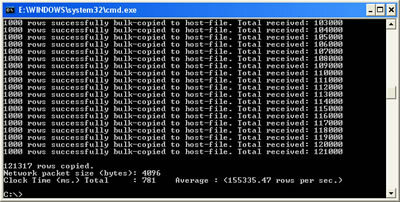 In this blog post, I’m going to walk through the basics of BCP (bulk copy program). 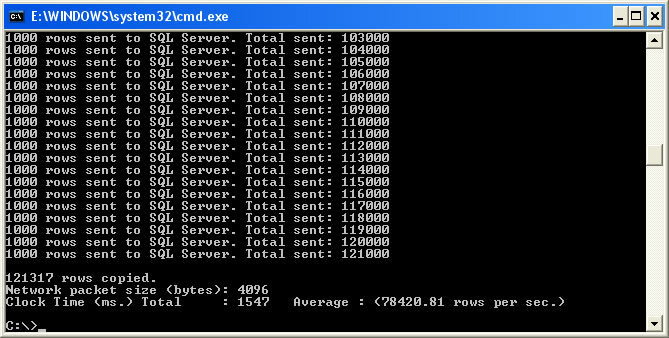 BCP is a utility that installs with SQL Server and can assist with large data transfers. Let’s see what parameter options are available to use. 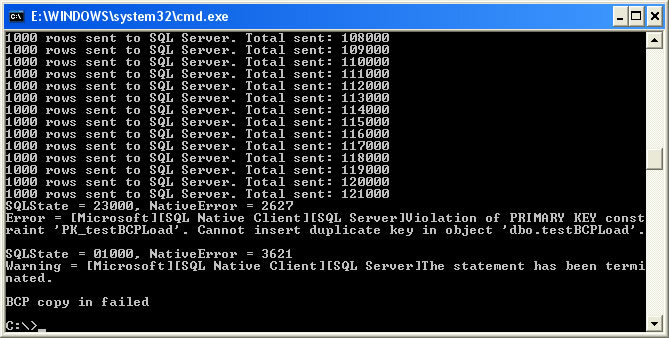 From the command line on a machine with SQL Server installed, type “bcp” and press Enter. You can specify either an entire table to copy or a query. The query should be surrounded in quotations and must also include the fully qualified table name. -c indicates character data type, -n indicates native data type; if neither one is specified, by default you will be prompted for the data type for each column. Now let’s put this together and run some BCP commands. All of these examples will use the AdventureWorks 2008 sample database. First, let’s export an entire table. To do this, we’ll use the “out” parameter. I don’t normally export an entire table… or at least, not in one process. So let’s walk through what it would look like to export the same table using a query. This will use the “queryout” parameter. You’ll notice that the total duration for the query was shorter than for the full-table export. This is because we’re only exporting a few of the columns. This is important to keep in mind when bcp’ing data: you’ll get better performance if you only export the data elements that you actually need. Now that we’ve exported some data, let’s walk through the process of importing this data. 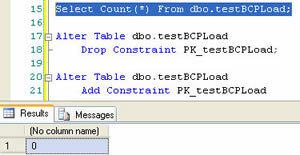 First, let’s create a table with a constraint that will result in some errors. You should receive a Primary Key error. 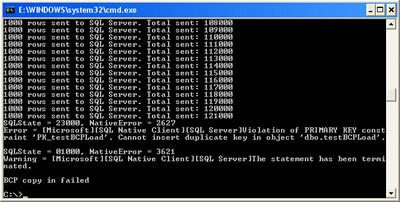 When you check your results in SQL Server, you should find no results loaded into the table. This is BCP’s default behavior. If you’re accessing the data across a WAN, perhaps via a VPN connection, try to remote desktop (mstsc) to the actual SQL Server to perform the BCP. If possible, keep the operation on the same local drive or even local network as the server; the less distance data needs to travel across a network, the faster BCP will perform. 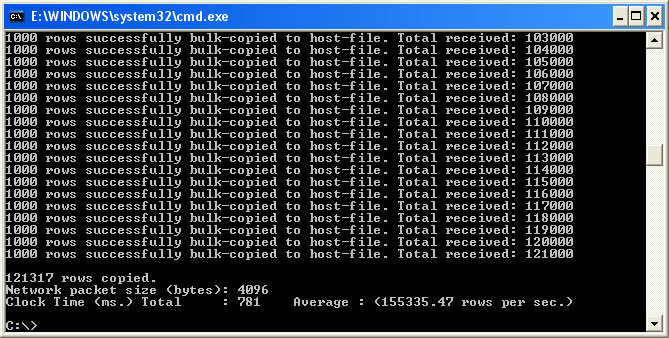 If you need to copy large amounts of data (i.e. >100mm rows), try breaking the data into smaller chunks. This will help if you have an error during BCP (i.e. a PK error can rollback the entire import operation by default, although there are options that can change this behavior). When working with partitioned tables, I find it very efficient to segregate the data imported/exported by partition. If you’re BCP’ing data into a new table, you can minimize impact on the server by waiting to create your indexes after all the data is loaded. 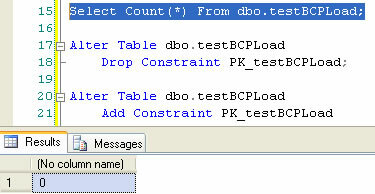 I like to construct my queries in SSMS, then copy them to BCP. Since the command-line utility does not support copy and pasting, I create a text file with my BCP command in NotePad, then save the command as a .cmd. To execute, just call the .cmd file. Last week, I blogged about how to perform one-to-many inserts with table-valued parameters, a feature new in 2008. For those who do not yet have 2008 or will not have it in the near future, it may still be beneficial to use XML for bulk inserts. I’ve found that this is more efficient when performing large parent/child inserts, i.e. 1 parent record to 100 child records. Keep in mind that there’s a point where doing an insert with XML is more expensive than using a traditional INSERT stored procedure. I haven’t run any tests yet to help define what that threshold is… more to come on this in the near future. Cannot find either column “myXML” or the user-defined function or aggregate “myXML.VALUE”, or the name is ambiguous. Late last night, I executed a 70mm update on a replicated table. This was a somewhat low priority update, so the primary goal (aside from the data change) was to avoid any issues on the publishing and subscribing servers, including replication latency errors. 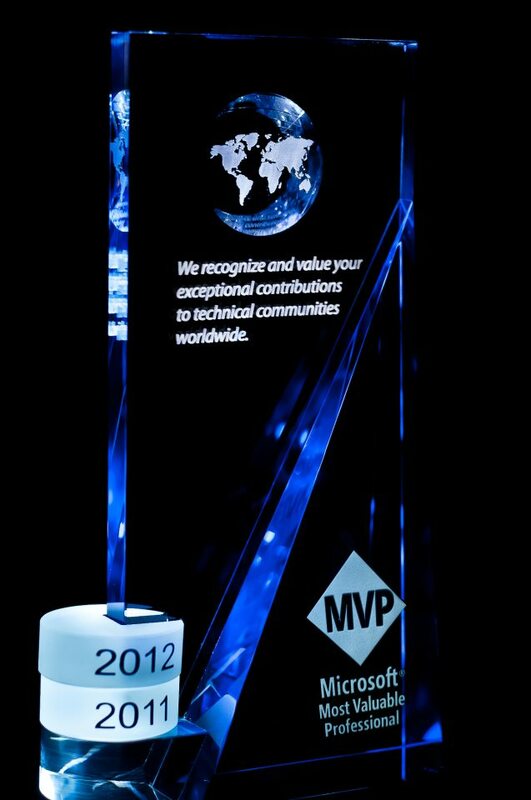 I have performed many large updates in the past, but this was the first on a replicated table. 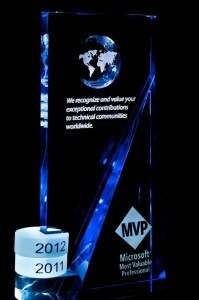 To minimize impact, one of our system DBA’s suggested the use of a replicated stored procedure. Basically, instead of replicating each of the 70mm updates as a singleton transaction, the replicated stored procedure is called on the subscribing server, which then performs the bulk update locally. This was my first time using it and it worked beautifully. Another of my colleagues, Jeff M., suggested the use of a control table. Normally, I would just output the last affected ID and update the script manually. However, this also worked so well that it will be adopted in all future update scripts. Using the following pseudo-script and a replicated stored procedure, I was able to execute the update on 70mm records in 11.5 hours with *zero* impact on the servers and replication. I could’ve probably increased the batch size and reduced the execution time even further, but as I mentioned, this was a low priority update, so there was no need to push it. This process should work equally well on non-replicated updates; merely replace the Execute statement with the actual update.